Can you see the marbling? It is so beautiful. Like every steak wants to be, but is not quite. The flavor's intense and delicate at the same time. The texture is an an exercise in that over-used adage: melt in your mouth. Liked the blueberries on top, but Northwest rhubarb maceated in sugar might have been even better. And the olive oil drizzle on top was overkill. 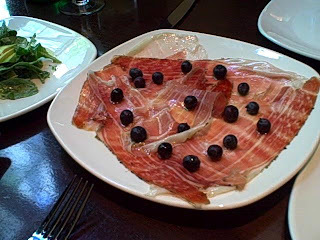 The amazing ham stood on its own. It was some of the best damn ham I've ever eaten. Go. Get some. Let's take a tour of chef Adam Stevenson's charcuterie. Click here. Sure do wish I were still reviewing so I could sing the praises of the wit of the menu scribblers at the Feedback Lounge in West Seattle. Give it a look-see and betcha it'll make you giggle. Made a quick trip to Wenatchee Thursday and on the way back over the mountains, I called my Auntie Eileen and asked: "Where's the best old-fashioned bakery?" I loved going to her house to gorge on Twinkies and Ho Hos and Ding Dongs. She should have owned stock in Hostess. Anyhoo, she sent me to Sure to Rise Bakery in Cashmere, where the cases were loaded with cookies, doughnuts (including a Big Foot, a sorta maple bar with chocolate frosting on the "toes"), butterhorns, cinnamon rolls as big as a hubcap and pies just out of the oven. Drat, they were out of strawberry-rhubarb, but the blackberry was beautiful and a steal at $7, plus change. Brought a whole pie home and was impressed by the flaky crust, the not-too-sweet, thick, but not too thick filling. Artisan bakeries are wonderful. I love them. But think there's also room enough for places doing it old-school. Like Nielsen's in Queen Anne. Where else? Was on the phone talking to chef Holly Smith (pictured at this year's James Beard Awards in NYC), asking if I could come in her kitchen. She said sure, and if I waited until August, then I could work with the new pastry chef. Neil Robertson, who recently left the building at Canlis. Neil Robertson who is one of the best pastry chefs in Seattle. Maybe even the best. I cannot wait to taste what he does at CJ! Can't wait to cook in chef Holly's kitchen. Pity the poor layer cake! Those darling cupcakes have stolen your spotlight, shoving the majestic layered beauties into the deep background. It seems as if it's practically impossible to find a piece of layer cake in restaurants around Seattle. Or am I missing something? In honor of National Devil's Food Cake Day (May 19), I'm going to take a crack at making one. Why not? When I was younger and had a house full of siblings to help tackle a big batch of sweets, I'd make sheet cakes all the time. The sticky business of frosting a layer cake was vexing, though. It always turned out lumpy and bumpy. But, as the old saying goes, practice makes perfect. I'll post a pic of my effort. Anybody care to share a failproof recipe? My little darling was the exact opposite when she was that age, a hyper-picky eater. The food had to be in the white family (potatoes, pasta, bread) and underseasoned. She once declared: "My palate is too sharp!" It was a huge challenge not to make a big deal out of it and eventually she came around. She still hates tomatoes and isn't crazy about mushrooms (unless they're morels), but will try just about everything. You can meet "Hungry Monkey" author Amster-Burton June 1 at the UW Bookstore. Not sure if he and Iris will be making anything for the audience to eat! And one of the questions lead to RR's statement above. There's absolutely no doubt the times they are a' changin... but I'd like to believe that newspaper food critics still offer something. Maybe I'm just wishful thinking that having experience and an expense account gives professional critics an edge. Nancy Leson from The Seattle Times was in the audience and she asked about the sticky issue of anonymous critics who might have an ax to grind posting hateful, hurtful reviews. RR deflected the concern, saying the give and take on sites usually evens things out. She didn't have a very satisfying answer to my question: What are your favorite restaurants in Seattle? (She Twittered about the cocktails at Spur.) She said she didn't get a chance to get out much. Hey Lady, I will show you around town. Just say the word. Click here for a short video of the start of Ms. Reichl's appearance. 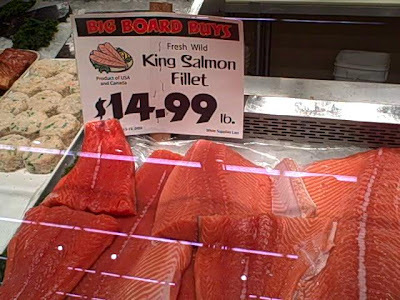 Got a cold shock this morning when I called Whole Foods to ask the price of Copper River salmon: $39.99 a pound for king, $29.99 for sockeye. Too rich for me! I posted my chagrin on Twitter/Facebook (naturally) and instantly heard from a friend who pointed me to Ballard Market, which is running a sweet deal on troll caught Kings from SE Alaska: $14.99 a pound. The fish is gorgeous. I bought a couple of pounds and I'm contemplating just how I'm going to cook it: grilled with alder or seared and finished in the 275 degree oven (Jon Rowley-style). What I'm completely clear about is the Washington asparagus on the side, on sale at Ballard Market for $1.59. What's your favorite way to prepare salmon? Are you tingling in anticipation of this weekend's fabulous Cheese Festival? Like Pavlov's mutt, my mouth starts to water just thinking about all the magnificent stuff to sample. I'm going to get the party started early by slipping into the Cheese Cellar at 5 today for a special event featuring the spectacular wines from Willamette Valley's Penner-Ash paired with cheeses and an appearance by Tami Parr, the founder of the Pacific Northwest Cheese Project and author of "Artisan Cheese of the Pacific Northwest: A Discovery Guide." Copies of this soon-to-be-released book will be on sale and the author will sign. Lately, I've been especially obsessed with cheese. I cannot stop thinking about the Italian truffle cheese they use on one of the incredible pizzas at Serious Pie. I'm searching for a source. Any ideas? Maybe I'll score some tonight. 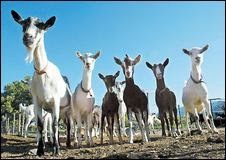 By the way, those adorable goats are from one of my all-time favorite cheese makers, Quillisascut, where I'm going this summer to take one of the amazing culinary courses in my quest to go from critic to cook. Anybody else enrolled? Went to a special lunch at Lark today put on by the Makah tribal trollers and Washington Trollers Association featuring a range of speakers talking about the efforts to preserve habitat and elevate the profile of this local product. Which, of course, was on the menu. Chef John Sundstrom is a master of letting ingredients like this gorgeous fish shine without getting all fancy/fussy. I was so impressed with the pickled salmon served as an app, beautiful radishes from Full Circle Farm. He seared it and brined it and it was buttery and sublime. The grilled fish on the main plate was cooked perfectly, very moist, the flesh just flaking, not "medium rare". The Ozette potatoes were a treat, too, this ancient variety is practically impossible to cultivate. They tasted rustic, almost earthy. 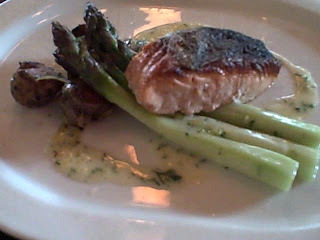 And asparagus completed this picture of spring flavors. Stalks peeled, not snapped. Chinook's new release of semillon offered a bright, crisp contrast to the rich flavors. What made the meal even more memorable was the company, which included a commercial fisherman who has worked out of Neah Bay for 18 years. You can find this beautiful fish tomorrow at Whole Foods and, possibly, at Fisherman's Terminal. It doesn't have the same cache as Copper River salmon, but it tasted as good, if not better to me. Better because it's from Washington. Ah, I never get tired of reading the liquor license permit applications. It's the best "sneak preview" of what's coming to a neighborhood near you. In my stomping grounds, the former Veil is moving toward B and B restaurant. I peeked into the window the other day and they've taken the place down to the studs. So curious about what's going to take shape a block from Crow, where I happy hour-ed last week. Love the Meditteranean pupu platter. Not cheap at $8, but plenty for two. Other new names popping onto the beer/wine/liquor license radar: Citizen (706 Taylor Ave. N.), Little Red Bistro at 400 Dexter and Bones Backyard BBQ at 1250 First Ave. S.
So happy to see new places opening in this punishing economy. Now, it's up to us to support these efforts. Even though my income has taken a huge hit, I still feed my need to dine. What about you? Still going out? 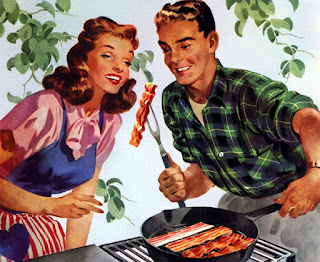 My darling daughter made me a card with a retro bacon illo. Aww, so salty/sweet! Her gift to me is to cook breakfast and dinner today, a huge undertaking for a kid who's totally lukewarm about being in the kitchen. I blame myself. I have such warm memories of hanging out in the cozy confines of my grandmother's kitchen, dragging a step stool to the stove to stir a pot of crazy stew she let me create when I was barely 5. By the time I was 9, I was making family dinners, but this was a grim necessity in the choppy wake of my mother splitting from my father and leaving three children in his care. Oh, did I mention? They were both alcoholics. But wait. There's a happy ending. I took comfort cooking, feeding and bossing around my younger sibs. (Thank goodness they're forgiving people.) And when I had a kid, I was sure I could pass along everything I knew and loved to her. But shoot. It turns out I'm a terrible teacher and she was a super picky eater and our relationship flouished elsewhere, but fizzled in the kitchen. I keep trying, luring her with the promise of unlocking the secrets of a great mac-and-cheese or the ease of stir-frying. How will she feed herself? I fret. Sure, she has mastered nachoes and can make a frozen pizza, but is completely ambivalent about the rest. Until today. When she promises to give it her best effort and that's the best possible Mother's Day present I could ask for because it's made with love, my favorite ingredient. Had a great time, but way too short! Not enough meals in the day to even make a dent... but I sure tried. Loved Marlo & Sons in Brooklyn, best chicken fried steak I've had, I dunno, ever. Wonderful pastrami at Katz Deli. Beautiful brunch in one of the prettiest dining rooms nobody's ever heard of: New Leaf Cafe in Fort Tryon Park. Downright pastoral. Spectacular spread with the Southern Foodways Alliance folks at Butter: fiddleheads and lentils, pate crostini topped with shaved fennel, chard ravioli, flatbread, deep-fried soft-shell crab, ramps, incredible wine. After that, went to Momofuku Milk Bar for Dulce de Leche layer cake, Candy Bar Pie, Pork Buns (pictured above), then I fell into a sugar coma. Went back for lunch today at Momofuku Ssam, which is attached to the Milk Bar. Had a three-course lunch and sat at the counter. Could not believe how good the brisket was. So tender, yet not falling apart, in an intensely flavored broth, rice noodles. So simple, but stunning. Really. 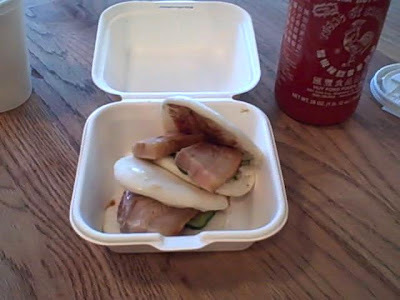 I'm not just swept away on the David Chang mania. I'll file a separate report soon on the James Beard awards soon. 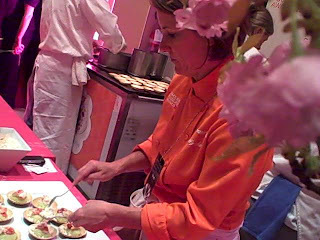 There were 1,000 people at Chef's Night Out at Vermillion in Midtown, which was a swank setting but the food was lousy. Well, except for the panni puri outside. 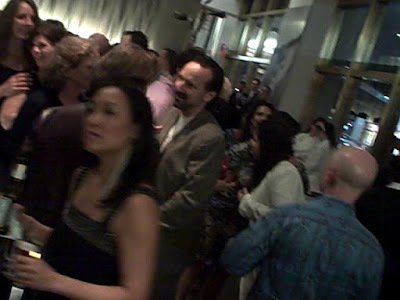 Here's who I high-fived, hand-shaked, hugged, roughly in order of appearance: Bill Smith, Calvin Trillin, Francis Lam, John Besh, Scott Barton and his lovely lady, Michelle, Bill Smith, Carol Puckett, Lee Anne Gault, Karen Carrier, Martha Foose. Also spotted across the crowded room: Jerry Tranfeld, Thierry Rautureau, Michael Bauer, Anne Burrell, Drew Nierpont, some curly-headed red-haired cutie pie I just know is in a band, but I cannot think of his name, and 900-some others. Here's a little (shaky) video. Did I mention, the food was not so hot, but the cocktails were cool? I sipped blood orange juice with gin and Indian seasonings. Spicy!